Call of Cthulhu is a horror fiction role-playing game based on H. P. Lovecraft's story of the same name and the associated Cthulhu Mythos. The game, often abbreviated as CoC, is published by Chaosium; it was first released in 1981 and is currently in its seventh edition, with many different versions released. It makes use of Chaosium's Basic Role-Playing (BRP) system, with special rules for Sanity. 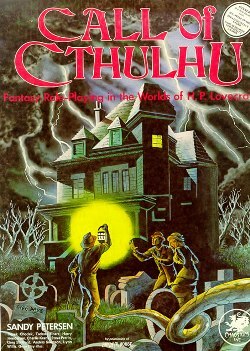 Call of Cthulhu 1st edition box cover, 1981. The setting of Call of Cthulhu is a darker version of our world, based on H. P. Lovecraft's observation (from his essay, "Supernatural Horror in Literature") that "The oldest and strongest emotion of mankind is fear, and the strongest kind of fear is fear of the unknown." The original game, first published in 1981, uses mechanics from Basic Role-Playing, and is set in the 1920s, the setting of many of Lovecraft's stories. Additional settings were developed in the Cthulhu by Gaslight supplement, a blend of occult and Holmesian mystery and mostly set in England during the 1890s, and modern/1980s conspiracy with Cthulhu Now and Delta Green. More recent additions include 1000 AD (Cthulhu: Dark Ages), 23rd century (Cthulhu Rising) and Ancient Roman times (Cthulhu Invictus). The protagonists may also travel to places that are not of this earth, represented in the Dreamlands (which can be accessed through dreams as well as being physically connected to the earth), to other planets, or into the voids of space. In keeping with the Lovecraftian theme, the gamemaster is called the Keeper of Arcane Lore, or simply the keeper, while player characters are called "investigators". CoC uses the Basic Role-Playing system first developed for RuneQuest and used in other Chaosium games. It is skill-based, with player characters getting better with their skills by succeeding at using them for as long as they stay functionally healthy and sane. They do not, however, gain hit points and do not become significantly harder to kill. The game does not use levels. CoC uses percentile dice (with a results ranging from 1 to 100) to determine success or failure. Every player statistic is intended to be compatible with the notion that there is a probability of success for a particular action given what the player is capable of doing. For example, an artist may have a 75% chance of being able to draw something (represented by having 75 in Art skill), and thus rolling a number under 75 would yield a success. Rolling ​1⁄5 or less of the skill level (1-15 in the example) would be a "special success" (or an "impale" for combat skills) and would yield some extra bonus to be determined by the keeper. For example, the artist character might draw especially well or especially fast, or catch some unapparent detail in the drawing. The players take the roles of ordinary people drawn into the realm of the mysterious: detectives, criminals, scholars, artists, war veterans, etc. Often, happenings begin innocently enough, until more and more of the workings behind the scenes are revealed. As the characters learn more of the true horrors of the world and the irrelevance of humanity, their sanity (represented by "Sanity Points", abbreviated SAN) inevitably withers away. The game includes a mechanism for determining how damaged a character's sanity is at any given point; encountering the horrific beings usually triggers a loss of SAN points. To gain the tools they need to defeat the horrors – mystic knowledge and magic – the characters may end up losing some of their sanity, though other means such as pure firepower or simply outsmarting one's opponents also exist. CoC has a reputation as a game in which it is quite common for a player character to die in gruesome circumstances or end up in a mental institution. Eventual triumph of the players is not assumed. The original conception of Call of Cthulhu was Dark Worlds, a game commissioned by the publisher Chaosium but never published. Sandy Petersen contacted them regarding writing a supplement for their popular fantasy game RuneQuest set in Lovecraft's Dreamlands. He took over the writing of Call of Cthulhu, and the game was released in 1981. Since Petersen's departure from Chaosium, continuing development of Call of Cthulhu passed to Lynn Willis, credited as co-author in the fifth and sixth editions, and more recently to Paul Fricker and Mike Mason. The game system underwent only minor rules changes in its first six editions (between 1981 and 2011); the current seventh edition, released 2014, includes more significant rules alterations than in any previous release. 1st edition 1981 Boxed set Includes 16-page Basic Role-Playing booklet in addition to main rulebook. 2nd edition 1983 Boxed set Includes a single rulebook; minor rules changes. 3rd edition 1986 Boxed set Divides rules into separate Investigator's Book and Keeper's Book booklets. 4th edition 1989 Softcover Includes content from the Cthulhu Companion and Fragments of Fear: The Second Cthulhu Companion supplements. 5th edition 1992 Softcover First version to credit Lynn Willis as co-author. Edition 5.5 1998 Softcover Reorganized and updated version of the 5th edition, with new cover art; "Edition 5.5" designator appears on title page. 20th Anniversary Edition 2001 Leather-bound hardcover book Limited edition bound in green leather, with new "ancient tome" layout. 6th edition 2004 Hardcover, softcover, or PDF file Same layout and content as 20th Anniversary Edition. 7th edition 2014 Hardcover, softcover, or electronic file Rules significantly revised by Paul Fricker and Mike Mason. New cover art and full-color layout. Print version released spring 2016. For those grounded in the RPG tradition, the very first release of Call of Cthulhu created a brand new framework for table-top gaming. Rather than the traditional format established by Dungeons & Dragons, which often involved the characters wandering through caves or tunnels and fighting different types of monsters, Sandy Petersen introduced the concept of the Onion Skin: Interlocking layers of information and nested clues that lead the player characters from seemingly minor investigations into a missing person to discovering mind-numbingly awful, global conspiracies to destroy the world. Unlike its predecessor games, CoC assumed that most investigators would not survive, alive or sane, and that the only safe way to deal with the vast majority of nasty things described in the rule books was to run away. A well-run CoC campaign should engender a sense of foreboding and inevitable doom in its players. The style and setting of the game, in a relatively modern time period, created an emphasis on real-life settings, character research, and thinking one's way around trouble. The first book of Call of Cthulhu adventures was Shadows of Yog-Sothoth. In this work, the characters come upon a secret society's foul plot to destroy mankind, and pursue it first near to home and then in a series of exotic locations. This template was to be followed in many subsequent campaigns, including Fungi from Yuggoth (later known as Curse of Cthulhu and Day of the Beast), Spawn of Azathoth, and possibly the most highly acclaimed, Masks of Nyarlathotep. Shadows of Yog-Sothoth is important not only because it represents the first published addition to the boxed first edition of Call of Cthulhu, but because its format defined a new way of approaching a campaign of linked RPG scenarios involving actual clues for the would-be detectives amongst the players to follow and link in order to uncover the dastardly plots afoot. Its format has been used by every other campaign-length Call of Cthulhu publication. The standard of CoC scenarios was well received by independent reviewers. The Asylum and Other Tales, a series of stand alone articles released in 1983, rated an overall 9/10 in Issue 47 of White Dwarf magazine. The standard of the included 'clue' material varies from scenario to scenario, but reached its zenith in the original boxed versions of the Masks of Nyarlathotep and Horror on the Orient Express campaigns. Inside these one could find matchbooks and business cards apparently defaced by non-player characters, newspaper cuttings and (in the case of Orient Express) period passports to which players could attach their photographs, increasing the sense of immersion. Indeed, during the period that these supplements were produced, third party campaign publishers strove to emulate the quality of the additional materials, often offering separately-priced 'deluxe' clue packages for their campaigns. Additional milieux were provided by Chaosium with the release of Dreamlands, a boxed supplement containing additional rules needed for playing within the Lovecraft Dreamlands, a large map and a scenario booklet, and Cthulhu By Gaslight, another boxed set which moved the action from the 1920s to the 1890s. In 1987, Chaosium issued the supplement titled Cthulhu Now, a collection of rules, supplemental source materials and scenarios for playing Call of Cthulhu in the present day. This proved to be a very popular alternative milieu, so much so that much of the supplemental material is now included in the core rule book. Pagan Publishing released Delta Green, a series of supplements originally set in the 1990s, although later supplements add support for playing closer to the present day. In these, player characters are agents of a secret agency known as Delta Green, which fights against creatures from the Mythos and conspiracies related to them. Arc Dream Publishing released a new version of Delta Green in 2016 as a standalone game, partially using the mechanics from Call of Cthulhu. Lovecraft Country was a line of supplements for Call of Cthulhu released in 1990. These supplements were overseen by Keith Herber and provided backgrounds and adventures set in Lovecraft's fictional towns of Arkham, Kingsport, Innsmouth, Dunwich, and their environs. The intent was to give investigators a common base, as well as to center the action on well-drawn characters with clear motivations. In the years since the collapse of the Mythos collectible card game (production ceased in 1997), the release of CoC books has been very sporadic with up to a year between releases. Chaosium struggled with near bankruptcy for many years before finally starting their upward climb again. 2005 was Chaosium's busiest year for many years with ten releases for the game. Chaosium took to marketing "monographs"—short books by individual writers with editing and layout provided out-of-house—directly to the consumer, allowing the company to gauge market response to possible new works. The range of times and places in which the horrors of the Mythos can be encountered was also expanded in late 2005 onwards with the addition of Cthulhu Dark Ages by Stéphane Gesbert, which gives a framework for playing games set in 11th century Europe, Secrets of Japan by Michael Dziesinski for gaming in modern-day Japan, and Secrets of Kenya by David Conyers for gaming in interwar period Africa. In July 2011, Chaosium announced it would re-release a 30th anniversary edition of the CoC 6th edition role-playing game. This 320-page book features thick (3 mm) leatherette hardcovers with the front cover and spine stamped with gold foil. The interior pages are printed in black ink, on 90 gsm matte art paper. The binding is thread sewn, square backed. Chaosium offered a one-time printing of this Collector's Edition. On May 28, 2013, a crowdfunding campaign on Kickstarter for the 7th Edition of Call of Cthulhu was launched with a goal of $40,000; it ended on June 29 of the same year having collected $561,836. It included many more major revisions than any previous edition, and also split the core rules into two books, a Player's Guide and Keeper's Guide. Problems and delays fulfilling the Kickstarters for the 7th edition of Call of Cthulhu led Greg Stafford and Sandy Petersen (who had both left in 1998) to return to an active role at Chaosium in June 2015. Chaosium has licensed other publishers to create supplements using their rule system, notably including Delta Green by Pagan Publishing. Other licensees have included Infogrames, Miskatonic River Press, Theater of the Mind Enterprises, Triad Entertainment, Games Workshop, Fantasy Flight Games, RAFM, Goodman Games, Grenadier Models Inc. and Yog-Sothoth.com. These supplements may be set in different time frames or even different game universes from the original game. Shadow of the Comet (later repackaged as Call of Cthulhu: Shadow of the Comet) is an adventure game developed and released by Infogrames in 1993. The game is based on H. P. Lovecraft's Cthulhu Mythos and uses many elements from Lovecraft's The Dunwich Horror and The Shadow Over Innsmouth. A follow-up game, Prisoner of Ice, is not a direct sequel. Prisoner of Ice (also Call of Cthulhu: Prisoner of Ice) is an adventure game developed and released by Infogrames for the PC and Macintosh computers in 1995 in America and Europe. It is based on H. P. Lovecraft's Cthulhu Mythos, particularly At the Mountains of Madness, and is a follow-up to Infogrames' earlier Shadow of the Comet. In 1997, the game was ported to the Sega Saturn and PlayStation exclusively in Japan. In 2001, a stand-alone version of Call of Cthulhu was released by Wizards of the Coast, for the d20 system. Intended to preserve the feeling of the original game, the d20 conversion of the game rules were supposed to make the game more accessible to the large D&D player base. The d20 system also made it possible to use Dungeons & Dragons characters in Call of Cthulhu, as well as to introduce the Cthulhu Mythos into Dungeons & Dragons games. The d20 version of the game is no longer supported by Wizards as per their contract with Chaosium. Chaosium included d20 stats as an appendix in three releases (see Lovecraft Country), but have since dropped the "dual stat" idea. A licensed first-person shooter adventure game by Headfirst Productions, based on Call of Cthulhu campaign Escape from Innsmouth and released by Bethesda Softworks in 2005/2006 for the PC and Xbox. In February 2008, Pelgrane Press published Trail of Cthulhu, a stand-alone game created by Kenneth Hite using the GUMSHOE System developed by Robin Laws. Trail of Cthulhu's system is more mystery oriented and focuses mostly on interpreting clues. In September 2008, Reality Deviant Publications published Shadows of Cthulhu, a supplement that brings Lovecraftian gaming to Green Ronin's True20 system. In October 2009, Reality Blurs published Realms of Cthulhu, a supplement for Pinnacle Entertainment's Savage Worlds system. In 2010, Cubicle 7 published an official role-playing game, The Laundry and a number of supplements, all based on Charles Stross's "Laundry Files" series. In April 2011, Chaosium and new developer Red Wasp Design announced a joint project to produce a mobile video game based on the Call of Cthulhu RPG, entitled Call of Cthulhu: The Wasted Land. The game was released on January 30, 2012. In 2018, Metarcade produced Cthulhu Chronicles, a game for iOS with a campaign of nine mobile interactive fiction stories set in 1920s England based on Call of Cthulhu. The first five stories were released on July 10, 2018. Mythos was a collectible card game (CCG) based on the Cthulhu Mythos that Chaosium produced and marketed during the mid-1990s. While generally praised for its fast gameplay and unique mechanics, it ultimately failed to gain a very large market presence. It bears mention because its eventual failure brought the company to hard times that affected its ability to produce material for Call of Cthulhu. Call of Cthulhu: The Card Game is a second collectible card game, produced by Fantasy Flight Games. The first licensed Call of Cthulhu 25-millimetre (1.0-inch) gaming miniatures were sculpted by Andrew Chernack and released by Grenadier Models in boxed sets and blister packs in 1983. The license was later transferred to RAFM. As of 2011, RAFM still produce licensed Call of Cthulhu models sculpted by Bob Murch. Both lines include investigator player character models and the iconic monsters of the Cthulhu mythos. As of July 2015, Reaper Miniatures started its third "Bones Kickstarter", a Kickstarter intended to help the company migrate some miniatures from metal to plastic, and introducing some new ones. Among the stretch goals was the second $50 expansion, devoted to the Mythos, with miniatures such as Cultists, Deep Ones, Mi'Go, and an extra $15 Shub-Niggurath "miniature" (it is, at least, 6x4 squares). It is expected for those miniatures to remain in the Reaper Miniatures catalogue after the Kickstarter project finishes. Call of Cthulhu: The Official Video Game is a survival horror role-playing video game developed by Cyanide and published by Focus Home Interactive for PlayStation 4, Xbox One and Windows. The game features a semi-open world environment and incorporates themes of Lovecraftian and psychological horror into a story which includes elements of investigation and stealth. It is inspired by H. P. Lovecraft's short story "The Call of Cthulhu". William A. Barton reviewed Call of Cthulhu in The Space Gamer No. 49. Barton calls the game "an excellent piece of work." He noted that there were some shortcomings resulting from assumption of rules details from RuneQuest that are not in CoC itself, but praised it overall, saying "the worlds of H. P. Lovecraft are truly open for the fantasy gamer., and calling the game a satisfactory experience. David Cook reviewed Call of Cthulhu for Dragon magazine #61 (May 1982). He commented: "It is a good game for experienced role-playing gamers and ambitious judges, especially if they like Lovecraft’s type of story." Call of Cthulhu was ranked 1st in the 1996 reader poll of Arcane magazine to determine the 50 most popular roleplaying games of all time. The UK magazine's editor Paul Pettengale commented: "Call of Cthulhu is fully deserved of the title as the most popular roleplaying system ever - it's a game that doesn't age, is eminently playable, and which hangs together perfectly. The system, even though it's over ten years old, it still one of the very best you'll find in any roleplaying game. Also, there's not a referee in the land who could say they've read every Lovecraft inspired book or story going, so there's a pretty-well endless supply of scenario ideas. It's simply marvellous." Arkham Horror - a cooperative board game based on the Mythos. Cthulhu Live - a live action role-playing game version of Call of Cthulhu. CthulhuTech - another role-playing game, conceived for a "Cthulhu science-fiction setting". ^ Cook, Monte (2007). "Call of Cthulhu". In Lowder, James. Hobby Games: The 100 Best. Green Ronin Publishing. pp. 42–45. ISBN 978-1-932442-96-0. ^ Petersen, Sandy; Willis, Lynn. "Game Info: Call of Cthulhu". RPG.net. Skotos Tech, Inc. Retrieved March 29, 2015. ^ Turnbull, Don (August 1982). "Open Box: Call of Cthulhu". White Dwarf. Games Workshop (32): 18. ISSN 0265-8712. ^ a b Ivey, Shane (July 24, 2012). "Inside Call of Cthulhu 7th Edition". The Unspeakable Oath. Retrieved January 25, 2013. ^ Paul Maclean. "Call of Cthulhu 20th Anniversary Edition". Valkyrie Quarterly. Retrieved September 2, 2015. ^ "Call of Cthulhu (1st Edition)". RPGGeek.com. Retrieved September 1, 2015. ^ "Call of Cthulhu (2nd Edition)". RPGGeek.com. Retrieved September 1, 2015. ^ "Call of Cthulhu (3rd Edition)". RPGGeek.com. Retrieved September 1, 2015. ^ "Call of Cthulhu (4th Edition)". RPGGeek.com. Retrieved September 1, 2015. ^ a b "Call of Cthulhu (5th Edition)". RPGGeek.com. Retrieved September 1, 2015. ^ "20th Anniversary Edition Call Of Cthulhu RPG". Chaosium.com. Chaosium. Archived from the original on October 20, 2001. Retrieved September 12, 2015. ^ "Call of Cthulhu (6th Edition/20th Anniversary releases)". RPGGeek.com. Retrieved September 1, 2015. ^ "Call of Cthulhu (6th Edition)". RPGGeek.com. Retrieved September 1, 2015. ^ a b "Call of Cthulhu (7th Edition)". RPGGeek.com. Retrieved September 1, 2015. ^ Frances, Phil (November 1985). "Open Box: Dungeon Modules". White Dwarf. Games Workshop (71): 7–8. ISSN 0265-8712. ^ Sutherland, Jon (November 1983). "Open Box: Dungeon Modules". White Dwarf. Games Workshop (47): 14. ISSN 0265-8712. ^ "Taking Preorders: Call of Cthulhu 30th Anniversary Edition". Chaosium.com. Archived from the original on July 30, 2011. Retrieved July 16, 2011. ^ "Call of Cthulhu 7th Edition". Kickstarter. Retrieved June 11, 2015. ^ "Wizards' d20 Cthulhu Forum to Close". Yog-Sothoth.com. November 18, 2003. Retrieved March 28, 2016. ^ "The Trail of Cthulhu". Archived from the original on July 15, 2011. Retrieved August 17, 2007. ^ david jarvis (September 15, 2008). "Shadows of Cthulhu is now on sale!". Retrieved September 16, 2008. ^ "Realms of Cthulhu". Retrieved January 30, 2010. ^ Stross, Charles (December 12, 2010). "A message from our sponsors". Charlie's Diary. Retrieved June 13, 2011. ^ UK Roleplayers (March 10, 2010). "Charles Stross' "The Laundry Files" RPG Announced". Retrieved June 13, 2011. ^ Cubicle 7. "The Laundry – Cubicle 7 Entertainment Web Store". Retrieved June 13, 2011. ^ "Call of Cthulhu Coming to Mobile". Archived from the original on May 17, 2011. ^ "Call of Cthulhu The Wasted Land". Retrieved June 5, 2011. ^ "Call of Cthulhu The Wasted Land Launches". Retrieved February 7, 2012. ^ "Apple Store: Cthulhu Chronicles". Retrieved July 10, 2018. ^ "MetaArcade: Cthulhu Chronicles". Retrieved July 10, 2018. ^ "MetaArcade launches Cthulhu Chronicles horror game on iOS". Retrieved July 10, 2018. ^ a b Barton, William A. (March 1982). "Featured Review: Call of Cthulhu". The Space Gamer. Steve Jackson Games (49): 4–7. ^ a b Cook, David (May 1982). "The Dragon's Augury". Dragon. Lake Geneva, Wisconsin: TSR (#61): 70-71. ^ "Chaosium Awards". Chaosium. Retrieved April 27, 2015. ^ "Origins Award Winners (1995)". Academy of Adventure Gaming Arts & Design. Archived from the original on 2008-01-02. Retrieved 2007-11-01.